Prairie clovers come in all shapes and sizes. ﻿﻿﻿﻿﻿﻿﻿﻿As the spring flora transitions into summer, the erect and creeping prairie clovers of all sizes, shapes and colors begin dotting our landscapes, helped along by this year’s above-average rainfall. Prairie clovers (genus Dalea) are great indicators of intact grasslands and savannas in Texas and are heavily utilized by wildlife. Texas is blessed with 42 of the 70 species of prairie clovers that occur in the United States. Prairie clovers prefer prairies and savannas with little competition. Fire suppression practices, however, have eliminated the wildfires that cleared out encroaching woody plants and renewed our prairie grasslands and savannas. Now the expansion of woody shrubs and trees threatens many of the prairie clovers, which need warm, sunlit prairie or savanna landscapes to survive. 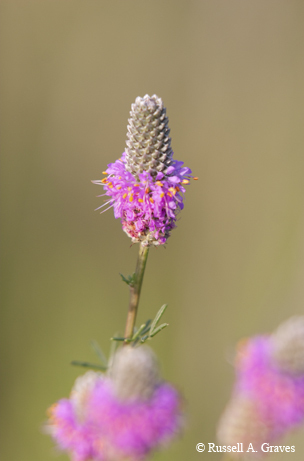 Purple prairie clover (Dalea purpurea) is known for its showy purple flowers that bloom from May through July. In Texas, it occurs in the north and northeast portions of the state and Guadalupe Mountains in West Texas. During the Lewis and Clark Expedition (1804–06), Lewis saw American Indians gather purple prairie clover leaves, soak them in water and apply them to fresh wounds. American Indians also used the plant as a heart medicine and diarrhea remedy. The easiest places to view this prairie clover include Blackland Prairie remnants in North Texas and the prairie at the southern end of Lake Ray Roberts State Park. White prairie clover (Dalea candida) is white-flowered and known for its tall, slender, showy upright clump habit, with fine textured green leaves that are larger than those of the purple prairie clover. The easiest places to view this prairie clover include Blackland Prairie remnants in North Texas, Guadalupe Mountains National Park and Palo Duro Canyon State Park. Round-headed prairie clover (Dalea multiflora) is white-flowered and distributed along the middle and upper coast and Central and North Texas. A few easy places to view this prairie clover include Lake Mineral Wells State Park and Lyndon B. Johnson National Grasslands in North Texas. Feather dalea (Dalea formosa) is a thornless, colony-forming shrub that typically grows 2 to 3 feet tall and bears tiny, pinnately compound leaves and flowers with yellow and bright purple to pink-purple petals in short, head-like racemes. A few easy places to view this prairie clover include Big Bend National Park, Devils River State Natural Area, Franklin Mountains State Park, Palo Duro Canyon State Park and Seminole Canyon State Park. Black dalea (Dalea frutescens) is a thornless shrub up to 3 feet tall with flowers that are small and purple. It flowers from July to October. One of the showiest species of prairie clover is the golden prairie clover (Dalea aurea). The cone-shaped fuzzy flower spikes of golden prairie clover have a unique form. Hall’s prairie clover (Dalea hallii) is a rare endemic (found nowhere else but Texas) and is restricted to 18 counties in Central and North-Central Texas. However, many of these counties represent one location, and many of the sightings are historical (the plants have not been seen in 50 years or more). The flowers are yellow and orange and very distinct. The LBJ National Grasslands is one of the few reliable places to see this rare and very showy prairie clover. If you see Hall’s prairie clover, the TPWD Wildlife Diversity Program is highly interested in gathering information on the location, habitat and number of plants present. Another globally rare prairie clover that occurs in Texas is Comanche Peak prairie clover (Dalea reverchonii). This is one of a few prostrate-growing purple-flowered prairie clovers and is restricted to certain shallow-soil habitats in the Fort Worth Prairie of North-Central Texas. Botanists at the Botanical Research Institute of Texas in Fort Worth are working with private landowners to conserve this Texas endemic. While you are traveling or hiking in prairie and savanna landscapes this late spring or summer, keep an eye out for prairie clovers. Texas is blessed “over and over” with prairie clovers, so enjoy these extremely diverse and dazzling members of the legume family.